Established in 2005, Utopia offers Holistic Therapy, Healing and Meditation dedicated to wellbeing, harmony and balance. My passion is Holistic Healing, Crystals and Meditation and the aim is to support you upon all levels of being - physically, emotionally, mentally and spiritually. I live in Kimbolton (near St. Neots and Huntingdon) and work locally, offering therapies to individuals, Establishments and at Mind Body Spirit Events. I also offer Meditation sessions and Self-Development workshops by request. This may be 1-1 or a small group. I became interested in the deeper aspects of being human after completing a degree in Psychology with the Open University in 2000. I was very interested in the nature of consciousness and the humanistic approach to psychology. I have a background in care and education, inclding working for many years with children and adults with special needs. I completed a Diploma in Stress Management (Holistic Therapies) in 2002 and qualified in Aromatherapy, Massage, Reflexology and Indian Head Massage. I incorporated the beautiful additions of Ayurvedic Holisitc Facial and Crystal Therapy in 2011. At this time I began meditating on a regular basis and became more inspired and creative, writing meditations, insights and poetry. 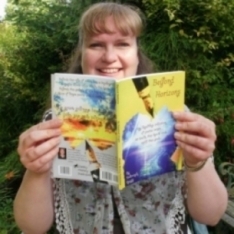 I published a little book of inspired poetry 'Beyond Horizons' in 2015. Since 2012, I have visited adults with disabilities weekly in Residential homes, practising Aromatherapy Massage. The power of therapeutic touch and aroma shows the importance of connection upon a level beyond everyday interaction. I am a Fellow of the Federation of Holistic Therapists (FHT). "Life is a beautiful journey of transformation..."